The service formerly known as Froogle, Google Product Search, has received one of the most importance updates since it was launched, back in 2002. For some queries like [cell phone] or [scanner], Google detects identical products that are available in multiple online stores and lets you compare prices, read reviews and technical specifications on a single page. Until now, Google Product Search linked directly to the online store's web page and didn't include product reviews or detailed information about a product, like you can still see if you search for [barney]. Other comparison shopping sites like Shopzilla, MSN Shopping and Yahoo Shopping already have this feature and are more established destinations for finding products online. It's interesting that even Froogle used to include price comparison for an individual product, but the feature has been removed at some point. A mobile version of the site still waits for an update and Google Base needs more visibility. Looks like it's only rolled out to some users. I'm still getting the old interface. Yeah, same here. My interface is the old one, too. Sounds interesting though, innovation on Froogle has been pretty slim, IMO. I broke this story on April 11th, and I too have found from others that it is not found from everyone. At least I now know I am not just seeing things! See my post: Major change in Google Product Search results. The updated interface is displayed only for tech gadgets: scanners, wireless speakers, cameras, MP3 players, laptops etc. 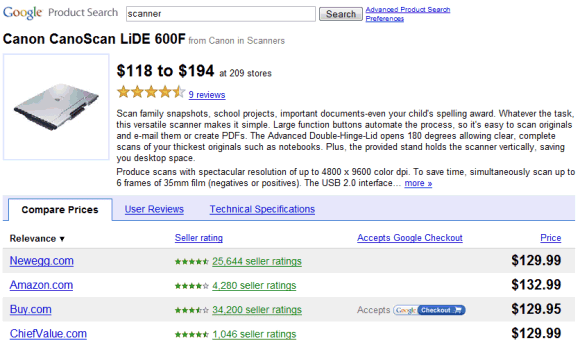 what do we have to include in the feed so the products will be mapped correctly to this "compare price" product page?